Education Preparation Council at the University of Mississippi brings together representatives from the University, School of Education, and Community Schools to participate in undergraduate and graduate instruction of students preparing to meet licensure requirements concerning nature, structure, standards, requirements, and practices in Teacher Education and Leadership. EPC is chaired by the Teacher Education Department Chair and consist of faculty from the University and school administrators, teachers, and community partners associated with or supportive of programs that prepare school professionals. This council is a collaborative advisory body to the School of Education. Elementary Principal (Pontotoc) Dr. Avence Pitman, Jr. 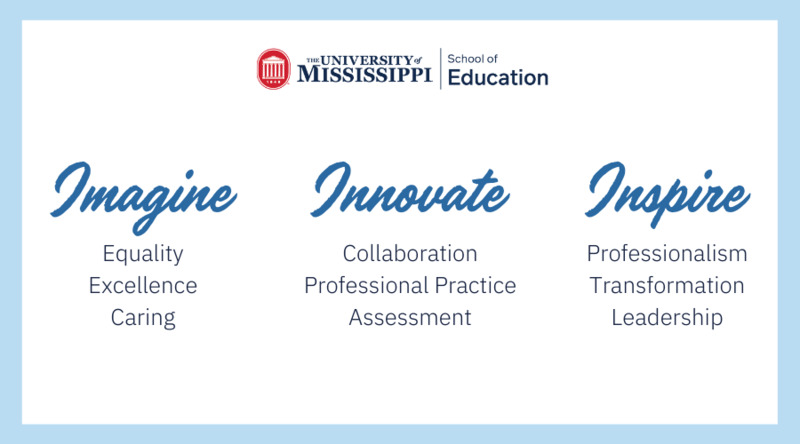 The mission of the Educator Preparation Council (EPC) is to develop, refine, and improve clinical practice, curriculum, and partnerships. Developing policies in all unit-wide matters relating to educator preparation programs. Monitoring state and national policies and overseeing how the unit implements state and national accreditation standards and licensing requirements. To encourage networking, collaboration and professional development among teacher education program faculty and partners. Promoting collaborations among the university, P-12 education partners, and other external state and national education constituencies. The council meets twice a year (once each semester) at the direction of the chair and also communicates throughout the year to make decisions and recommendations through an online collaboration site.